Recently, Oppo has launched its F1S and F1S Plus. 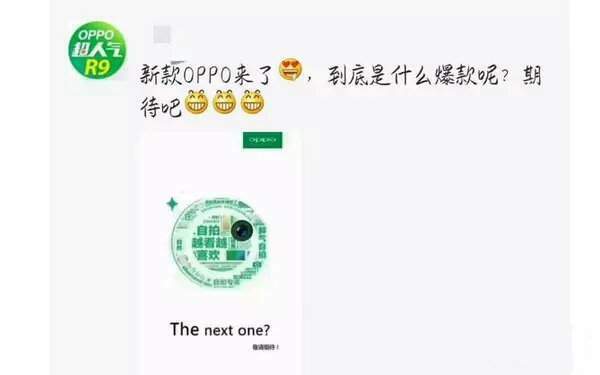 Now once again another Oppo smartphone is rumored to release in this other model by the name ‘R9S.’ This device is expected to get the same or even better response than the F1S and F1S Plus. Various teasers are leaked online about the device before the launch. This also increased the rumors in the market. R9S is the successor of R9 smartphone. R9S is expected to come later this year. Let me remind you that the R9 has sold over seven million units barely three months after the launch of the device. This device may face many competitions as other companies are doing well and launching their devices to give competition to each other. According to a report, the company is planning to launch the R9S with a slogan “The Next One” in the market. Over the specifications, Oppo R9S features a 5.5 inches IPS LCD Capacitive Touchscreen with 16M colors. The resolution is 720 x 1280 pixels with a pixel density of 267 ppi and protected by Corning Gorilla Glass. It can be expected that the company will use the latest technology to protect the device. R9S supports 2G, 3G, and 4G network technologies and also supports Hybrid Dual SIM. R9S runs on Android OS Marshmallow v6.0 and Color OS. R9S is powered by a 3,000 Li-Po nonremovable battery. It is expected that the phone will have a 13-megapixels primary camera with 4128 x 3096 pixels, Dual-LED flash and supports video recording with 2160p (4K). The secondary camera has a lens of 16-megapixels for selfies and video calling. Since Oppo is famous for selfie specialist smartphones. The company is doing great to maintain that status. The Camera features Autofocus, PDAF sensor, Gesture Shot, voice capture, face beauty, HDR, Video stabilization, Smile detection, Face detection, self-timer, touch focus, low light mode, ultra clear image, professional image, beautify and macro mode. Oppo R9S is powered by Qualcomm Snapdragon 625 (64 bit) chipset and 2 GHz Octa-core processor with Adreno 506.The RAM of the device is 3 GB or 4 GB and the internal memory is expected to be 32 GB or 64 GB which can be expandable up to 128 GB using microSD card. Oppo R9S sports Proximity, accelerometer, compass, ambient light, gyroscope, fingerprint sensor and hall effect. Other connectivity options are also available on the device, but no NFC is present. The weight of the device is expected to be around 150 grams. The device may come in Golden and Rose Gold color variants. The device supports VOOC technology. The device will be available in the market in a couple of months. And the Oppo R9S price will be about the same as of R9 which was launched just a few months back. For more information, Stay tuned and do subscribe to the website.